A pivoted spring bolt with an L shaped catch which fastens into the striking plate. 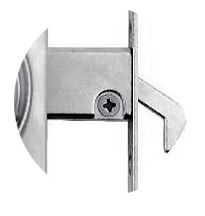 Typically used on sliding doors, some types just latch the door and some are locking. The image below shows a clutch bolt from a sliding door latch.